Dr. TA Loeffler is an educator, adventurer, nature advocate, author, and professional keynote speaker from St. John’s, Newfoundland and Labrador. TA is a professor of Outdoor Education and Recreation in the School of Human Kinetics and Recreation at Memorial University of Newfoundland. In 2015, TA was named to Canada’s Greatest Explorers 100 Modern-Day Trailblazers List by Canadian Geographic. Over the past 15 years, TA has shared her message of “Big Dreams, Big Goals” with over 100,000 youth in the province of Newfoundland and Labrador. TA’s writing details expedition preparation, training, and the life lessons gained from these ambitious pursuits. TA loves to share expeditions with schools and the community in engaging ways. For example, in 2015, TA climbed nine volcanoes and El Salvador’s Highest Peak during Volcanopalooza and paddled 210 kilometres from Lake Shipiskan to the sea along the Kanairiktok River in Labrador. TA completed a Great Big Walk across 750 km of the High Himalaya of Nepal during the spring of 2014. In September 2013, TA stood on the highest point in North Africa, Jebel Toubkal. In April 2012, TA skied 275 kilometres across unexplored Greenland and climbed the Arctic’s highest peak, Gunnbjørn Fjeld. In December of 2011, TA climbed Vinson Massif, the highest peak in Antarctica. Throughout this mountainous journey, TA has aimed to be a “public dreamer” to inspire others to have big dreams and big goals by sharing these adventures online, in schools, in the media, and through keynote speaking. You can also download TA’s One Pager to learn more about having TA come to speak at your event. 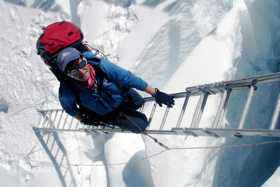 TA’s book, More than a Mountain, gives an inside look at climbing Everest. Take advantage of a free download of the first chapter of More Than a Mountain to start reading TA’s riveting book today. Dr. TA Loeffler brings 30 years of expertise leading people through significant life-changing experiences to every facet of her work. Her work and adventures have taken her to 45 different countries and all seven continents. TA has completed 6 and 4/5 of “The Seven Summits,” the highest peak on all seven continents. In 2015, TA was named to the “Canada’s Greatest Explorers 100 Modern-Day Trailblazers List” by Canadian Geographic. As a Professor of Outdoor Recreation at Memorial University of Newfoundland, TA has developed a reputation for excellence in experiential education because her students are more likely to be outside chasing icebergs than sitting in a classroom. TA inspires hope, possibility, and vision in those whose lives she touches. Over the past 15 years, TA has shared her message of “Big Dreams, Big Goals” with over 100,000 youth in the province of Newfoundland and Labrador. In 2018, TA was chosen by the Association of Experiential Education to deliver the Kurt Hahn Address at the 46th Annual Association of Experiential Education International Conference. TA is a talented athlete. TA uses strength training, running, tire pulling, biking, yoga, cycling and step aerobics to prepare for her expeditions. She has a passion for hockey and has played every position on the ice including goaltender. TA has coached several championship-winning hockey teams and has officiated at the national championship level. Through her experience in both sports and outdoor adventure, TA intimately appreciates teamwork and knows how to bring teams together to accomplish their goals and fulfill their greatest potential.